If you dream of a place where the wind comes sweepin’ down the plain and the wavin’ wheat can sure smell sweet when the wind comes right behind the rain, well… you can traverse to the great state of Oklahoma, or you needn’t go any further than Artistic Synergy of Baltimore to experience their latest offering, Oklahoma! by Richard Rodgers and Oscar Hammerstein II, Directed by H. Ray Lawson, with Music Direction by Jeff Baker and Choreography by Suzanne Zacker. This well-known classic is reincarnated to give us a glimpse into a simpler time and happier endings. Briefly, Oklahoma! takes place in a territory (not yet a state) not long after the turn of the century when there was a spirited rivalry between cowboys and farmers. Curly, a cowboy, and Laurey, a farm girl are quite in love and the story mainly revolves around these two characters. 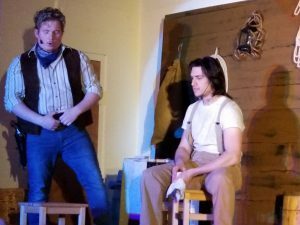 Laurey is pursued by the sullen, dark farm hand, Jud Fry and threatens her budding romance with Curly. 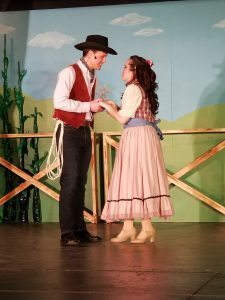 Throw in a spunky Aunt Eller, a whippersnapper of a cowboy, Will Parker, and a curious and spirited young woman, Ado Annie, who likes when men talk “purdy” to her, and you have the makings of a good, old-fashioned, feet stamping musical. Music Direction by Jeff Baker is superb as this strong ensemble sings through this soaring Rodgers and Hammerstein score with ease. 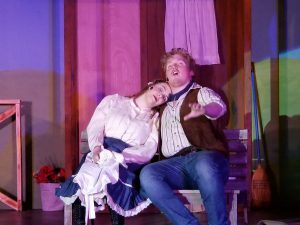 The use of canned music takes away from the energy of the piece, but that’s not to say it’s not energized and upbeat as the cast gives a good showing of this familiar music. Choreographer Suzanne Zacker seems to know her cast well and has created interesting and engaging choreography that is performed well by the ensemble. It’s worth mentioning that Zacker is a highlight in this piece, taking on the role of Dream Laurey, during the “Dream Ballet” number. Her grace and elegant movement during this number is impeccable and is certainly a praiseworthy performance that keeps you enthralled and entertained. Ray Lawson takes the reigns of this production and he should be applauded for his Direction, presenting this piece with a balance of the familiar and freshness. It’s always challenging to produce a tried and true story but Lawson wisely sticks with the traditional staging and seems to have a good comprehension of this material. The pacing is on point and the two and a half hour run time is no more or no less than what is needed to present this piece and still be entertaining for the audience. The ending of the show is a little lackluster, ending on a whimper rather than a bang, but I’m chalking that up to using recorded music, and I’m sure the cast will improve this ending with each performance. Overall, his vision is clear and it is a well thought-out, well-rehearsed production. Moving on to the performance aspect of this production, Josh Schoff takes on the complex and meaty role Jud Fry but, unfortunately, is a little weak in presentation. He certainly does not bomb in this role and he seems to have a good grasp of the character but also seems to be just going through the motions. His eyes dart all over the place and he rarely makes eye contact with his cast mates which loses that connection he must have to make his character work. This may seem like a knit-picky flaw but eye contact and that connection is essential for this role. Vocally, he’s a little shaky but emotes adequate emotion needed in songs such as “Poor Jud is Daid” and “Lonely Room” which redeems his performance a bit. With that being said, he looks near perfect for the role and is comfortable onstage and with a little more effort, could take this character to the hilt. Tackling the role of the feisty and spunky Aunt Eller is Donna Zubrowski and she is perfectly cast in this role. Zubrowski brings a certain authenticity to the part and her choices are befitting of such an endearing character. She has a great chemistry with the ensemble and is comfortable in the role making for a delightful performance. To go along with the more comedic characters, Lou Otero gives a humorous take on the role of Ali Hackim, the traveling salesman who finds himself in the wrong place at the wrong time and in the site hairs of a couple of young women of the territory. Otero has a good comprehension of his character, even if his accent is a little wonky, and he has good comedic timing. The young, optimistic couple Ado Annie and Will Paker are portrayed by Kristin Miller and Joe Weinhoffer, respectively, and both play these roles splendidly with an absolute believable performance and great chemistry. Miller embodies the giddy, immature, but yearning Ado Annie and, gives a terrific vocal performances as in her featured (and well-known) number “I Cain’t Say No.” Weinhoffer is brilliant as the lovelorn Will Parker and effectively and poignantly portrays the love his character has for Ado Annie. Vocally, he gives a commendable performance, especially in his featured number “Kansas City” where he also gets to show off his movement skills along with the rest of the male ensemble. Leading this ensemble are Austin Barnes, as the loveable and upstanding Curly, and Mea Holloway, as Laurey, the simple, independent farm girl. These two actors definitely know their characters and have a firm grasp on the material making for a strong leading duo. Barnes has a booming, smooth voice and is a powerhouse, making the audience take notice from the get with his rendition of “Oh, What a Beautiful Mornin’.” He fully embodies this character and gives a jovial flair to Curly, as it should be. He has as great presence on stage, giving a strong performance. Holloway is suited nicely for her role but seems a bit subdued and stiff at times It seems she lights up when she has lines and interaction but falls flat in between those instances and the character is not consistent in that aspect, drawing away from her obvious skill and talent. Her voice is absolutely appropriate and beautiful for this score and she gives a stellar vocal performance, shining in her featured numbers such as “Many a New Day,” “People Will Say We’re in Love,” and “Out of My Dreams.” Overall, the two work well with each other and, though a little forced at times, the chemistry is there and makes for a good showing. Final thought…Oklahoma! at Artistic Synergy of Baltimore is a well put-together production that does this classic, familiar piece justice. The pacing is good (for a show that could easily seem to go on forever), and the ensemble is strong, overall, and seem to enjoy working with each and off of each other. The traditional staging still holds its own in our modern age and the tunes are still delightful and will have you tapping your toes or drawn in to their poignancy. They just don’t write ‘em like this anymore! It’s definitely a fluffy, feel-good piece of theatre that works well for community theatres like Artistic Synergy of Baltimore and it’s a wise choice to produce the classics to remember where our modern shows came from and to introduce them to a new, younger audience. This production of Oklahoma! is definitely one you want to check out. 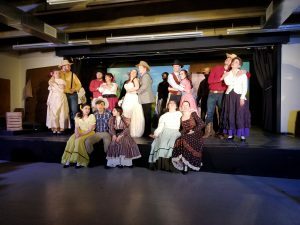 This is what I thought of Artistic Synergy of Baltimore’s production of Oklahoma!… What did you think? Please feel free to leave a comment! Oklahoma! will play through March 18 at Artistic Synergy of Baltimore, Prince of Peace Lutheran Church, 8212 Philadelphia Road, Baltimore, MD. For tickets, purchase them at the door or online. Tradition is what keeps things together for some people but there are folks who thrive on change. Tradition and Change certainly make strange bedfellows and Third Wall Production‘s lates offering, the classic Fiddler on the Roof, Directed by Lance Bankerd, with Music Direction by Edward Berlett, Choreography by Kali Baklor, Set Design by Jordan Hollett and Costume Design by Sally Kahn, takes us back to the early part of the 20th century and gives us the tale of a poor, Russian milkman struggling with and trying to balance his traditions and radical, new ideas of a new era. I have to admit, I had serious reservations when I walked into the theatre and realized Director Lance Bankerd is putting Fiddler on the Roof – a big show – in an intimate space and in the round! Well, as soon as the first number started, though it was a bit tight with such a massive cast, it actually worked and it worked quite well! Set Designer Jordan Hollett manages to give the audience a full musical theatre experience with set pieces and backdrops rather than full sets and it seems less tedious and just as effective. The story is told with benches and tables with a few “fancy” pieces such as a spinning bed and required wedding canopy. Kudos toe Hollett for his inventive design and intelligent use of space. Also worth mentioning is the painting of the large backdrops by Artists Ann Pallank, Amy Rudai, and Emma Hawthorn, adding great value to the space and the production as a whole. Sally Kahn’s Costume Design is on point and her choices for this ensemble fir the bill of a poor Eastern European village in the early 20th century. Her attention to detail is commendable as this piece is not only somewhat of a period piece but also a cultural piece dealing with rules and restrictions of the Jewish religion that Kahn seems to understand and wardrobes her actors as such. Kali Baklor takes on double-duty as both Choreographer and tacking the whirlwind role of Fruma-Sarah, the dead wife of the town butcher. Balkor’s choreography work is impressive and befitting for the piece and her ensemble. The space is intimate so there isn’t a ton of room for her large cast, but she uses what space she does have wisely with minimal but interesting and entertaining choreography. Along with keeping the cast in step, her take on the loud, obnoxious Fruma-Sarah is high-energy, confident and quite admirable. Music Director Edward Berlett has this ensemble sounding beautiful in each number and his work with actors in the featured numbers is apparent as they run smoothly and sound splendid. I do regret the orchestra has no recognition in the program because they sound absolutely phenomenal. Taking up almost a third of the space, they were not overwhelming and blended in nicely with the ensemble making for a very pleasant sound. Featured musician, violinist Jonathan Goram is a gem in this impressive orchestra as he didn’t falter once during his solos making for an sensational performance. Kudos to the pit orchestra for a job well done and, hopefully, you’ll all get an insert in the program before the production is over! Direction by Lance Bankerd is innovative and well-thought out, presenting this traditional musical in an nontraditional space. The space is tight, and the attempt of audience immersion from some of the cast is a little much, but some people enjoy that sort of thing and, overall, it was a joyous experience. There are a few curious casting choices, in appearance only, such as some characters who are younger than others actually looking older, but, all in all, it’s a very well put-together production. Fiddler on the Roof is A LOT of show and Bankerd has managed to keep the action moving and his cast kept the pace nicely. Major kudos to Lance Bankerd on a superb job with this piece. Emma Hawthorn takes a turn as Yente, the matchmaker and pulls off the part nicely. This role is more of a comic relief and has a lot of the funny lines, but Hawthorn’s timing is a bit off on some of the jokes that could have been gold. Overall, however, she gives a fine performance and she understands the important role (after all, there’s an entire song in her honor!). She leads the attempt to bring the audience into the action with asides and interactions and seems successful in her attempts. Michelle Hosier tackles the supernatural role of Grandma Tzeitel, who Tevye claims comes to him in a dream and she is delightful. She has a beautiful, strong soprano that is featured in “The Dream” and she’s comfortable and confident in the role. Michael Zellhofer takes on the role of Lazar Wolf and his performance is top notch. He has a strong stage presence and makes this role his own and plays it confidently with a balance of drama and brilliant comedic timing. 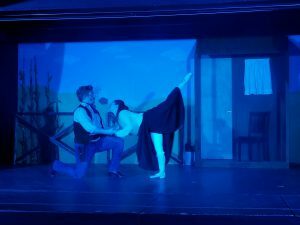 Taking on the roles of eldest daughter Tzeitel and her unintended beau, Motel, the tailor are Lauren DeSha and Daniel Plante. From the moment DeSha steps onto the stage, she is a joy to watch. She gives a natural, comfortable performance, both in the portrayal of her character and vocally, and she has great chemistry with her fellow cast mates, espeically with Plante, her character’s love interest. The two give a believable performance and though Plante may not give the strongest vocal performance, but he is certainly giving 100% effort making for a commendable and confident performance. Next up, Mea C. Holloway tackles the role of Hodel, the second eldest daughter and Joe Weinhoffer as portrays her counterpart, Perchik, the Student from Kiev. Aside from looking a bit older than the actress playing her older sister, Holloway gives a brilliant performance, vocally, but her portrayal of Hodel, though admirable, fell just a little flat. Weinhoffer’s interpretation of Perchik is spot on and his confidence and charisma shines through in his performance. Though he sounds a bit scripted, at times, his a clear, smooth, resonating voice fits the character near perfectly. Alex Clasing who plays Chava, the third eldest daughter, is a definite standout in this production and her performance is a pleasure to watch. Vocally, she has a strong, clear voice that makes one take notice, even in the group numbers like “Matchmaker” and her acting chops are on point. Clasing portrays Chava naturally and authenticly and works easily with her cast mates. Her performance is one to watch in this piece and I’m looking forward to seeing more from this young actor. Jenifer Grundy-Hollett as Golde is a treat and she gives this role 100%. Her comedic timing is spot on and she really grasps her character, making wise choices and making Golde a realistic mother and wife. Her lovely soprano shines through, vocally, especially in numbers like “Do You Love Me?” and “Sunrise, Sunset.” She does play the part with a heavy hint of New York City in both accent and attitude but she still pulls the part off authentically and works well with all her cast mates. Baltimore theatre veteran Roger Schulman as Tevye is the highlight of this production and he leads this ensemble with ease. Tevye is a traditional, yet jovial character and Schulman embodies these attributes superbly. His performance of Tevye’s signature “If I Were a Rich Man” is a joy to watch and Schulman refreshingly makes it his own. His overall delivery is natural and he makes the audience feel welcome and at home. He presents the subtle transition of his character seamlessly but with certainty and his presentation of Tevye’s evolution and growth is what knocks this performance out of the ball park. Final thought…Fiddler on the Roof is usually a show that people love or hate. Rarely is there an in between but this production at Third Wall Productions is a creative, innovative presentation of this classic Broadway show. I had my reservations with it being in-the-round, at first, but this production did not disappoint. The intimate space was a bit cramped for the large cast and the attempt of audience immersion was a bit much, but overall, Third Wall Productions can chalk this one up as a bona fide success. The gifted ensemble and orchestra is a joy to watch and hear and the outstanding performances of these talented players should not be missed. This is what I thought of Third Wall Productions’ production of Fiddler on the Roof… What did you think? Please feel free to leave a comment! Fiddler on the Roof will play through February 26 at Third Wall Productions, 5801 Harford Road, Baltimore, MD. For tickets, call the box office at 443-838-4064 or purchase them online. There are quite a few shows that are staples in small and community theatre and you will see them pop up weekly in small hamlets and big cities across this great country. Some shows are just so good they never get old and some, well… let’s just say they’re familiar and comfortable. Artistic Synergy of Baltimore’s latest offering, Joseph and the Amazing Technicolor Dreamcoat, with Music by Andrew Lloyd Webber and Lyrics by Tim Rice, is definitely in the category of never getting old, having been a continued success for nearly five decades. This production, Directed by Mike Zellhofer, with Music Direction by Edward Berlett, Choreogrpahy by Temple Fortson, Set Design by Jordan Hollett, Lighing Design by Jim Shomo, Sound Design by Charles Hirsch, and Costume Design by Lorelei Kahn, shows the ingenuity of a small theatre and manages to put on a well-crafted, fresh production of an old favorite. Set Design by Jordan Hollett is far from extravagant and is quite subdued, but a simpler design works for this piece because a Director and Set Designer can create a traditional setting or more whimsical and it will still work. Depending on the theatre and the space, the Set Design for Joseph and the Amazing Technicolor Dreamcoat can be a spectacle, but Hollet has decided against this and has gone with a couple of panels on either side of the stage with crudely painted Egyptian and desert scenes and a large, blank white canvas that stretches across the back of the stage reflecting the very colorful light show that happens throughout the production. His set pieces such as a very cartoon-y camel (that looked fabulous, but had some technical trouble the day I saw this production) and a bulky “chariot of gold” work well with this production and do not take away from the story but add to it. Overall, Hollett’s work is minimal, but compliments the piece very nicely. Lighting and Sound Design go hand in hand with this piece and where the set may be simply, Lighting Design by Jim Shomo is nothing short of a spectacle, in a good way. Shomo uses all the colors of the rainbow (at least all the colors mentioned in song) and lights the entire stage up like NYC’s famed night club Studio 54 in its hey-day. With what looked like state of the art equipment, the lighting is top notch. It’s worth mentioning there are a few heavy strobe effects that aren’t mentioned in the program or in the curtain speech, so, consider this a heads up! In general, Shomo has created a well thought-out design that adds great value to this piece. Sound is always a challenge for a small theatre (especially in unique places such as church basements) but Charles Hirsch tackles this challenge with the resources he has at his disposal. The space at Artistic Synergy is intimate, not small, but intimate and when you throw a full orchestra right next to the audience, there are going to be some balancing issues. However, there weren’t as many as there could have been and the actors who had featured roles had microphones that made their performances easy to hear, so, Hirsch was able to find that balance to make for an enjoyable performance. One thing I will say is that this is a loud show. I mean more so than the usual loud of a live performance with a live orchestra. There are parts of this show that are downright rock-concert loud and in this space, they might want to pull back just a tad, but, overall, it’s a very nice balance. Costume Design Lorelei Kahn is very fitting for this piece and many of the costumes are more of a suggestion of the setting rather than full blown costumes. The design is modern and traditional mixed and all of the actors seem very comfortable and everyone is uniform, which adds to the precise look of the piece. In a hometown homage, Jacob proudly displays his Baltimore Ravens jersey which went over very well with the audience in attendance. Joseph’s 11 brothers have a base costume of jeans, sandals, and different colored button down shirts and it’s a smart move because, for each scene, a costume piece is added or taken away depending on what is going on in the scene. The more traditional costumes, such as Egyptian guards, harem wives, and servants are all simple, but very effective and Kahn’s design is attentive and fitting for this production. Choreography by Temple Fortson is tight and precise, for the most part, and the cast seems to be comfortable in every dance and, more importantly, they seem to be having a blast, thus, leading to the audience having a blast right along with them. The dances aren’t too complicated that the cast of varying experience can’t handle, but not too simple that they’re simply doing jazz squares in every number. Fortson’s choreography is high energy and full of variety, keeping the story interesting for both the ensemble and the audience, alike. Kudos to Fortson for her work on this piece. Music Direction by Edward Berlett is superb as this ensemble and featured performers sounded well-rehearsed and confident in each number. The harmonies were present and the performances were tight, in general, and easy to understand. If you are familiar with the piece, you’ll be singing along (in your head, hopefully), and if you are not familiar, you will easily understand the vocals to follow along with the old biblical story. I must also mention the talent and impeccable sound of the live orchestra that took this production to a new level. I wish the names of the orchestra members were listed in the program (there could at least be an insert, these guys and gals are great!) because, just like Berlett is to be commended for his Music Direction, the orchestra deserves many kudos for their near flawless performance. Joseph and the Amazing Technicolor Dreamcoat is a sung-through show, meaning it’s all music, singing, and dancing with little to no script so, one could argue this type of show only needs a Music Director and Choreographer but there still needs to be a vision and Director Mike Zellhofer gives us a new look at this classic. Presenting an overall traditional staging, Zellhofer makes it fun for both the cast and the audience, and not taking the piece too seriously, but getting the story across smoothly with action that is easy to follow and not taking too much liberty and making it hokey, which is a danger when it comes to shows like this. Zellhofer seems to keep everything under control and crafts a very well-though out production that is a joy to watch. Switching to the performance aspect of this production, I want to mention that the entire ensemble does a fantastic job moving this story along and it’s easy to see each cast member is fully dedicated to this piece and is giving his or her all making for a very successful production. The voices are strong, the choreography is tight, and the chemistry is great as everyone looks as they are having a stellar and fun time with each other which, in turn, makes it fun for the audience. The roles of Jacob and Potiphar are taken on by Wayne Ivusich who seems to have a very good time with these roles and is comfortable and confident with his performance. He has a good command of the stage and, vocally, is fitting for these roles. He understands the humor in these characters and runs with it making for a strong performance. Amy Rudai and Lisa Rigsby take on the roles of the Baker and Butler, respectively and they give very good showings as these characters. Traditionally, these characters are doubled and played by two of the brothers, but it was refreshing to see the gender-blind casting for these roles and these ladies pulled them off very nicely. Vocally, they could have been a little stronger, but overall, they gave admirable performances, holding their own against the “guys” and they seems to have a blast with these roles. Of Joseph’s 11 brothers, there are a few featured roles with and Rueben, the eldest of the Children of Israel, played by Nick Ruth, is one of them. He performs the featured number “One More Angel in Heaven,” a fun country-western style song with a built in hoe-down in which the entire ensemble is dancing and singing about the demise of poor Joseph. Ruth does a commendable job with this number and though it is traditionally sung with a southern twang, his “Baltimore accent” is prominent, but it adds a certain charm to the performance. With a good command of the stage, Ruth gives a good showing and the number itself, is fun going from a slow and steady tempo to a high energy, upbeat tempo making for an pleasant performance. Asher, portrayed by Bill Bisbee, is another brother who has a featured number called “Those Canaan Days,” in the style of a traditional french ballad. Bisbee does a fine job with the french accent and the other brothers give him fitting backup. Though a slower paced song, the ensemble does a great job keeping it interesting and funny. Vocally, Bisbee gives a strong performance and he’s confident and performs with ease. Baltimore theatre veteran Jim Fitzpatrick tackles the role of the Elvis Presley impersonating Pharaoh and he tackles it with gusto. More than just a suggestion of the King of Rock and Roll, Fitzpatrick dons an entire Elvis Presley costume from the pompadour wig and large sunglasses down to the bell-bottomed jumpsuit and gives 100% to this role. His vocals are spot on and his performance is high-energy and he makes a superb showing. Featured brother Zebulon is played by Joe Weinhoffer and though, usually performed by the brother playing Judah, Weinhoffer performs the featured Caribbean themed 11:00 number, “Benjamin’s Calypso,” with the purpose of defending a wrongly accused little brother, Benjamin. It’s easy to see Weinhoffer is having a delightful time performing this number and the ensemble enthusiastically backs him up. Vocally, he is strong and comfortably holds his own against the ensemble with a very good presence on the stage. The Narrator is traditionally one of the only featured female roles and for this production at Artistic Synergy of baltimore, this role is split between Mea Holloway and Melissa Broy Fortson. At this particular performance, Mea Holloway takes on the role and though she does quite well, her performance isn’t without a few minor issues including lyrics and timing/cues. Also, at first appearance, with her darker makeup and frequent scowl, she’s a bit harsh looking for the usually jovial Narrator making her seem irritated and preoccupied and it affects her performance. At one point, because of the positioning of a speaker she became a headless storyteller as she was spotlighted from the neck down but her head disappeared behind the shadow of the said speaker – a simple blocking issue any experienced actor would have fixed immediately. Regardless of the minor issues, she has a strong, beautiful voice and, aside from the aforementioned timing/cue problems, she gives an admirable showing in this piece. 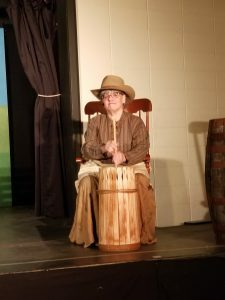 The titular role of Joseph, the lucky and favorite son of Jacob is portrayed nicely by Jim Gerhardt and he gives a strong, confident presentation. He makes the role his own and has a strong, clear voice to back up his performance. Though it is every actors responsibility and prerogative to make a role or song his or her own, occasionally, it’s wise to keep songs simple. In my experience in musical theatre, tenors love their money notes. How can they not? They feel good and they’re fun to sing. However, it is important to understand that every last note of every song does not have to be taken up an octave or harmonized to a higher note and, in this case, Gerhardt frequently toys with the melody and it loses that special something when it’s overdone. With that being said, his performance is absolutely commendable and he gives a fresh look at the character. His performance of “Any Dream Will Do” and “Close Every Door” (money note included) are very good and he is comfortable with this character and gives a strong, enjoyable performance. Final though… Joseph and the Amazing Technicolor Dreamcoat at Artistic Synergy of Baltimore is community and small theatre at its finest. With familiar nods to our charming little town of Baltimore and some very talented folks, it’s definitely worth checking out. The ensemble is dedicated and gives 100% to the performance and everyone is having a great time on stage and with each other, making for a fun, upbeat, feel-good show that can be enjoyed by all. That’s what I thought about Joseph and the Amazing Technicolor Dreamcoat, playing at Artisti Synergy of Baltimore… what did you think? Please feel free to leave a comment! Joseph and the Amazing Technicolor Dreamcoat will play through December 18 at Artistic Synergy of Baltimore, Prince of Peace Lutheran Church, 8212 Philadelphia Road, Baltimore, MD. Tickets are available at the door (cash, check, or credit card) or purchase them online.